Kids and students can visit their favorite pineapple under the sea with this licensed SpongeBob Square Pants 3D 5-in-1 combo-style bounce house. Hours of entertainment are to be had with Sponge Bob and his sidekick Patrick in the warm waters of Bikini Bottom. Experience more than 250 feet of real 3D imagery with SpongeBob's pineapple house and plenty of frolicking SpongeBob panels sure to attract eager participants and spectators! The 5-in-1 combo-style bounce house is the ultimate in inflatable jumpers! The large interior jumping area offers a basketball hoop and both log and pop-up obstacles. This bouncy castle has a climb feature and a convenient exit slide for hours of active fun! Parents and spectators are offered a clear view with the 360-degree mesh sides of this moonwalk. The 5-in-1 combo bounce house is made of light n strong fire-resistant vinyl for safety and durability. This 5-in-1 bouncy house is sure to make any indoor or outdoor event a great success! 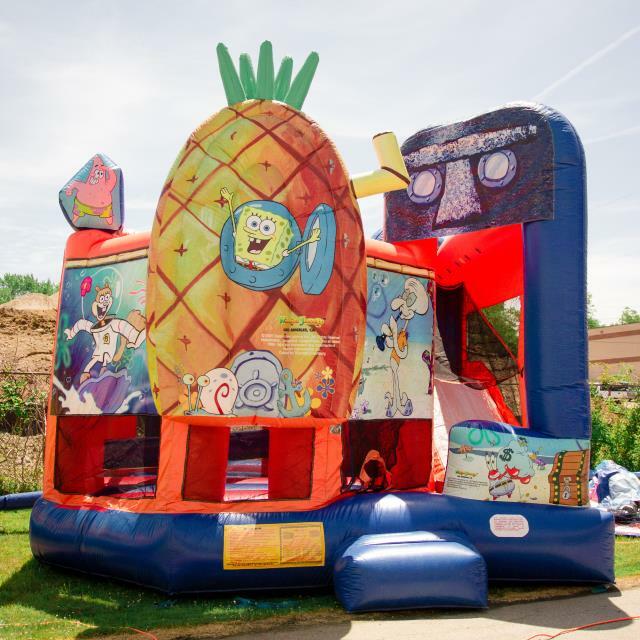 * Please call us for any questions on our game inflatable sponge bob rentals in Cleveland, Chardon OH, Mentor OH, Chagrin Falls OH, Ashtabula Ohio and surrounding communities.